First, what is mindfulness or mindfulness meditation? Quite simply, mindfulness means using meditation techniques (i.e. deep breathing, body scans, sitting with silence, visualization, deliberate walking etc.) to focus the mind and be more present. Being present means focusing on what is happening in the moment, rather than brooding in the past (i.e. rehashing Reviewer 2’s comments over and over and over) or anticipating the future (i.e. worrying about a deadline). By being present, we slow down, we quiet our minds and we increase our concentration, compassion and ultimately our well-being. Counter to our obsession with busyness, leaning in and having it all, mindfulness-based stress reduction (MBSR) programs suggest that we can achieve more by doing less. Multitasking and busyness leads to cognitive overload and hinders performance, creativity, innovation, decision-making and emotional regulation, which can lead to chronic stress and burnout, particularly teacher burnout. The stress makes you feel exhausted, the exhaustion stifles productivity, which makes you more stressed. By focusing on one thing (i.e. breathing) you train your mind to focus on one task and drown out the noise. Try it; the next time you are in an advising meeting with a student, focus on the student, really look at her, notice her demeanor, really listen to what she is saying without judging and without interjecting—you will find that the interactions are much more meaningful and productive than if you let your mind wander and think about all the things on your to-do list. Slowing down, and even purposefully slacking off, leads to more productive and fulfilling careers, happier workplaces and relationships. Research on the neuroscience of meditation seems to suggest that there are cognitive and emotional benefits of mindfulness meditation though results are mixed. Yet, many are rightly skeptical of the hype. Mindfulness has become something of a muddied hipster buzzword, “New Age gobbledygook,” to be served with kale and chia seeds. Purists lament that this secular version has departed from its Buddhist roots. Anderson Cooper’s interview with MBSR visionary Jon Kabat-Zinn even shows that corporations like Google have latched onto mindfulness to increase worker productivity and workplace satisfaction. Ultimately, one reason why the meaning of mindfulness is so muddy is perhaps because it is a practice that is unique and personal; there is no “right” way to practice mindfulness and one of the core tenets is to approach the practice with self-compassion and without judgment (i.e. removing thoughts like “I should be doing it this way” or “Why can’t I get this right?”). In this New Age gobbledygook vein, this post will not include a “how to” because while there are central features of mindfulness meditation, each person’s practice is a work in progress and personal. What I can share is that I have been practicing mindfulness meditation for a little over a year now, starting with the Penn Program for Mindfulness MBSR course as a way to manage stress that resulted from a traumatic personal tragedy. It works for me (and it may or may not for you). I have been productive despite the personal stress; I am more compassionate with myself; I am more able to distance myself from minor annoyances and incidents; I truly feel like I have taken on more by doing less because I am more mindful of what I am doing in the moment. Aside from the benefits to our own personal creativity, I think that mindfulness could benefit the profession as well—imagine compassionate peer reviewers and panel discussants, happier teaching experiences as Jarrod writes and respectful meetings. Mindfulness meditation is a “bottom-up” movement; by being compassionate, kind, forgiving, and focused, we model that behavior for those around us. To get started, try user-friendly, accessible apps like Calm; Stop, Breathe, Think; and Insight Timer that provide tutorials, guided and unguided meditations. MBSR courses provide a solid foundation, but require a greater time commitment. 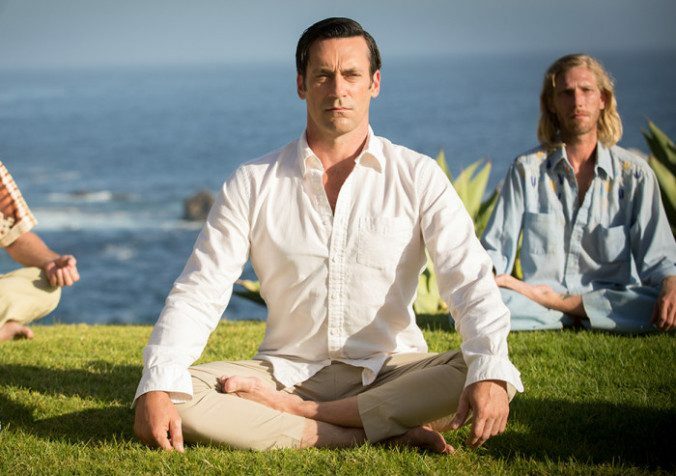 You can even go to Don Draper’s spiritual retreat. Om. And hypothetically, maybe you have stayed up late watching the Mets win (!!!) the NLCS and really, you’re just too old for that. The Mets are going to the World Series (!!! ), so really, anything is possible. I took a mindfulness meditation for stress relief course in grad school and the tools I learned remain so helpful. We should see if there are any rooms to have meditation or yoga breaks at ISA! Thanks, Cristina! I think having meditation breaks or rooms at conferences is a great idea. Conferences are so hectic that taking some time to pause might lead to more meaningful interactions and better focus.